Hello lacquer lovers. Here is another of the new Mish Mash polishes. Ozotic 533. 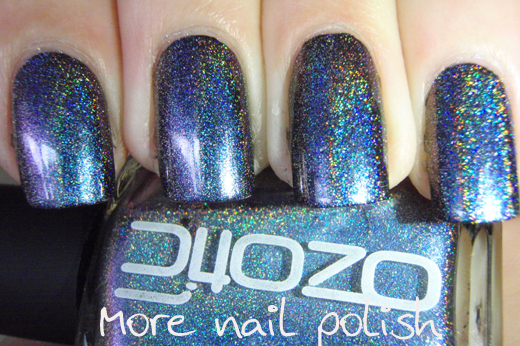 This is the holographic version of Ozotic 506, which is a cyan blue, with a purple multi chrome shift. This one really does look similar to 532, just as 506 and 505 are very similar too. One thing I noted with these polishes that I didn't say yesterday is that because of the Spectraflair in these polishes, the base multichrome colour is paler than the original non-holo version. Anyone that has played with Spectraflair would know how that it lightens your polish when you add it. They have the balance just perfect though, and it only lightens the base slightly. All these pictures were taken next to the window with diffused overcast skies, using the LED macro light on my camera. They are all two coats over a black base with Seche Vite top coat. 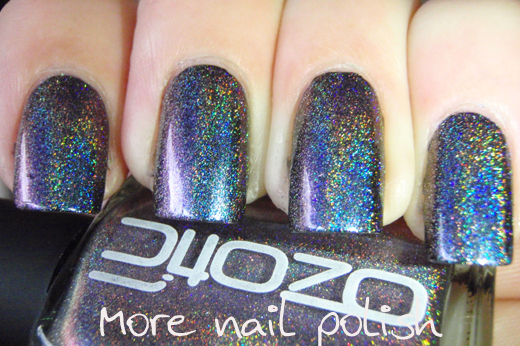 Also, Amy X asked if I could do a comparison swatch of one of these Mish Mash polishes vs a Spectrafranken holographic multichrome vs a multichrome with a holo top coat applied. Great idea, I will do up a comparison swatch this weekend. Great photos, the sparkle looks amazing! I have to quit reading your blog for now. My Mish Mash order from llarowe.com just shipped the other day. Seeing these photos, I can't help but cross my legs as hard as I can to stop from peeing my pants hahaha! Having said that, I can't wait to see the comparisons. And I am dying to see 531!